Whether you’re selling flip flops or 5-star hotels, there’s no doubt that Twitter can be a quick and easy way to up your social media marketing game, and of course it’s 100% free. Anyone can set up an account and start Tweeting, but it does take some special knowledge to use the service for business social media campaigns. There are a lot of Tweets out there; here’s how to get yours noticed amongst the noise. Too many times I’ve @messaged accounts to no reply. As a small business, others’ apathy works in your favour – if you reply to your messages and actively engage with other Tweeters, your particular birdsong will sounds above the competition. It’s as easy as scanning the news feed each day and sending a quick @message in reply to anything that interests you. Twitter’s advanced search page is here. Use it well. You can search for key words, phrases and questions pertaining to your business, and jump in where appropriate with helpful answers. For example, if you’re a WordPress guru, you could help a few Tweeters solve their WordPress woes. There’s no doubt that Twitter is about the long game, and engagement like I’ve mentioned above is the key to getting mentions and to increasing your follower count. On top of that, it’s important to add your Twitter link to your other social media profiles and company branding, as well as writing an interesting Twitter bio. Your profile picture is important – accounts with a human face as a profile picture tend to get more follows. Twitter’s list function can be a bit of a mystery until you know what it’s useful for. First of all, it’s simply a handy way of organising all your contacts. As a small business, you might want to make private lists of clients and suppliers, so you can find and engage with the right person at the right moment. Of course, a private list of your competitors will be a valuable source for market research and business inspiration.When it comes to public lists, think of keywords – lists are Google indexed and show up in Google search results, so name and describe your lists in line with your chosen SEO keywords. Public lists are also an ideal way of quickly and easily keeping up with the very latest in industry news. If you keep a list of the main influencers in your business area, you can just check this list every day, and reply to any Tweets that interest you, thereby keeping up that all-important level of engagement. 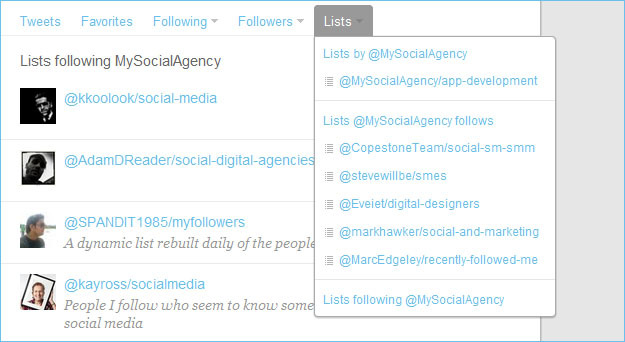 Finally, public lists are useful for branding – Twitter doesn’t tell our visitors a great deal about us in terms of a static profile, so the lists you create say a lot about who you are and why you’re here. So, the main rule is to engage, and with that you can’t go far wrong. By adding a few nifty tricks in the form of searches and lists, you’re on track for small business social media success.